Purchase a copy of Unmarked — hot off the presses! $30 + $5 shipping in the US. For sales to Europe, 30€ + 10€ shipping. NPR Story on the project. BBC Story about the project. Huffington Post story about the project. FOX News story about the project: TRANSCRIPT. VIDEO. Unmarked will be exhibited in the “Photobook Phenomenon”. Co-organized by Centre de Cultura Contemporània de Barcelona (CCCB) and the Fundació Foto Colectania. Barcelona, Spain. 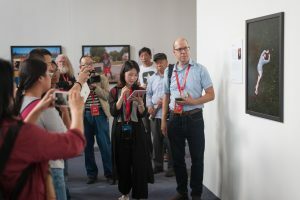 Curators: Martin Parr, Gerry Badger, Markus Schaden, Frederic Lezmi, Horacio Fernández, Ryuichi Kaneko, Erik Kessels, Irene de Mendoza. 17 March 2017 – 27 August 2017. Unmarked will be tentatively exhibited in De Best Verzorgde Boeken. 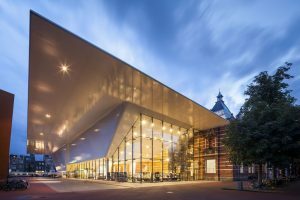 Stedelijk Museum Amsterdam, The Netherlands. Fall 2017. I wrote the chapter, “Crime, Evidence and Proof” chapter (#2) in text the forthcoming The Routledge Companion to Photography and Visual Culture. Edited by Moritz Neumüller. Taylor & Francis, New York. Unmarked Book – First Copy!! 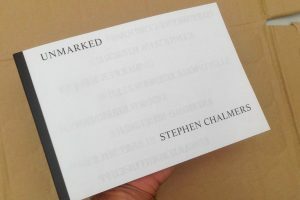 The new monograph Unmarked features twenty photographs by Stephen Chalmers, and twenty satellite images of the same locations. These images are accompanied by a text on the American landscape. It is only at the very end of the book that the reader is given the clues to decipher the story behind the imagery: all the photographs were taken at sites where serial murderers disposed of their victims. The research to locate these sites was performed through the public records of closed serial killer cases and historic investigative photographs. Chalmers then used GPS technology and mapping software, visited the exact spot where the bodies were found, and photographed the landscape. This is the first monograph of Stephen Chalmers’s work. The book is the culmination of a long-term photographic project, and its book form was conceived in dialogue with the editor and the designer early in 2016. The official publication date will be in February 2017. Information on purchasing a copy of this book will be available soon!! Ariel Shanberg and I put together an exhibition of work, titled “The Bright Invisible”, featuring the work of the following artists: Edie Bresler, Sarah Cross, Noritaka Minami, Kris Sanford, Millee Tibbs, D’Angelo Williams, and Rana Young. I’ll be at the Pingyao International Photography Festival (中国平遥国际摄影大展) to introduce the exhibition and to speak about the artists’ works. September. EXHIBITION: Connections to Ohio. Curator: Richard E. Jurus, II. Sinclair College Art Galleries. September-October. Co-host (with Erika Gentry and Moritz Neumüller) and speaker. 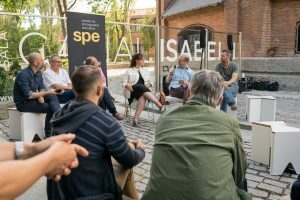 The Society for Photographic Education (SPE) in partnership with Istituto Europeo di Design (IED) Madrid and the PHotoEspaña, the International Festival of Photography and Visual Arts of Madrid hosted a Floating Conversation between European and United States photographers. Canal Isabel II Exhibition Center, c/ Santa Engarria 125, Madrid. 17 June.